Clemson travels to Las Vegas this weekend to compete in an annual 15-team tournament hosted by UNLV. The 54-hole Southern Highlands Championship begins Friday, March 12 and finishes Sunday, March 14. The Tigers will be looking to score its first victory since claiming the National Championship last year. The event is held at Southern Highlands Golf Club in Las Vegas, NV, a long par 72 course (7,381 yards). The strong field is highlighted by No. 1 Florida, who has five victories to its credit. Also competing this weekend will be Oklahoma State, the defending champion of this event, and UNLV, the host school. Other schools scheduled to compete are Georgia, Georgia Tech, UCLA, Arizona State, Augusta State, North Carolina, Wake Forest, New Mexico, Arizona, Washington, N.C. State, and Auburn. Leading the way for Clemson’s lineup this weekend will be senior Matt Hendrix, who is coming off the first individual title of his career in the Puerto Rico Classic. Hendrix, who leads Clemson with a 70.86 stroke average, won at Puerto Rico by one shot in the Tigers’ most recent competition. Gregg Jones will once again compete for the Tigers this weekend. The senior has a 71.53 stroke average and three top 10 finishes in his six tournaments this season. Also playing this weekend will be Jack Ferguson, whose 71.41 stroke average is second-best on the team. Brent Delahoussaye and Brian Duncan round out Clemson’s starting five for the third time this spring. Delahoussaye has a 73.53 stroke average and one top 10, while Duncan has a 75.54 stroke average for the year. Clemson finished third in this event last season, the only time the Tigers failed to finish in first or second place in 2002-03. 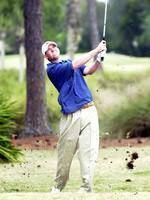 Hendrix had a top 10 finish for Clemson, while current Nationwide Tour professional D.J. Trahan also placed in the top 10 for the Tigers.